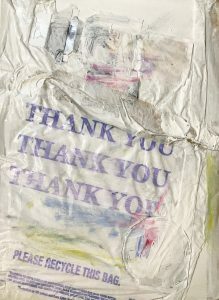 For this Bridge 2 project, I used found materials such as wrapping paper and plastic bags and superimposed them on a canvas board. 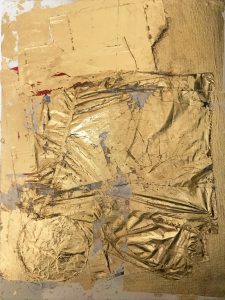 Both left side of the diptychs are painted in white acrylic with strong brushstrokes and impasto whereas the other ones are gilded with gold leaf. Each diptychs are similar in composition, but the different colors give different impressions to each piece. The found objects are composed to look like a garbage heap on the streets. 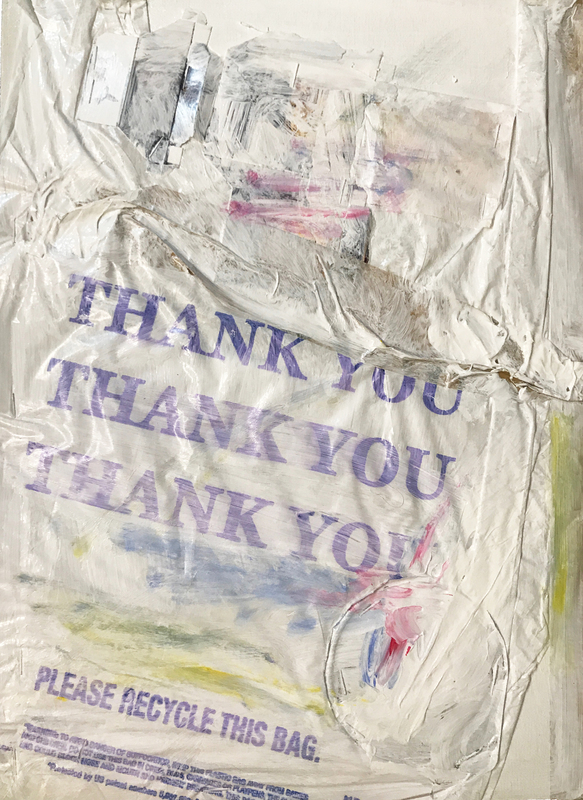 By putting garbage onto canvas and painting them, I tried to change the materiality of garbage which is cheap and ephemeral into something valuable and object of high art. 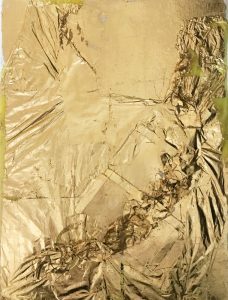 The dirty and stained images of garbage reveals the dark side of consumer capitalist society by changing the impressions of the materials. People are encouraged to consume excessively by businesses’ marketing and their design and people identify themselves with what they consume. My previous five diptychs had different compositions and they were simpler in layers than these two diptychs. 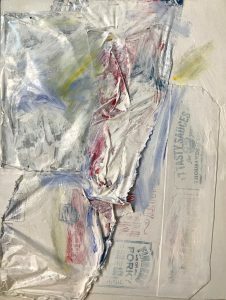 The plastic bag I used in this work was the most successful at supporting my topic because it had very interesting texture when it was attached to the board and painted. 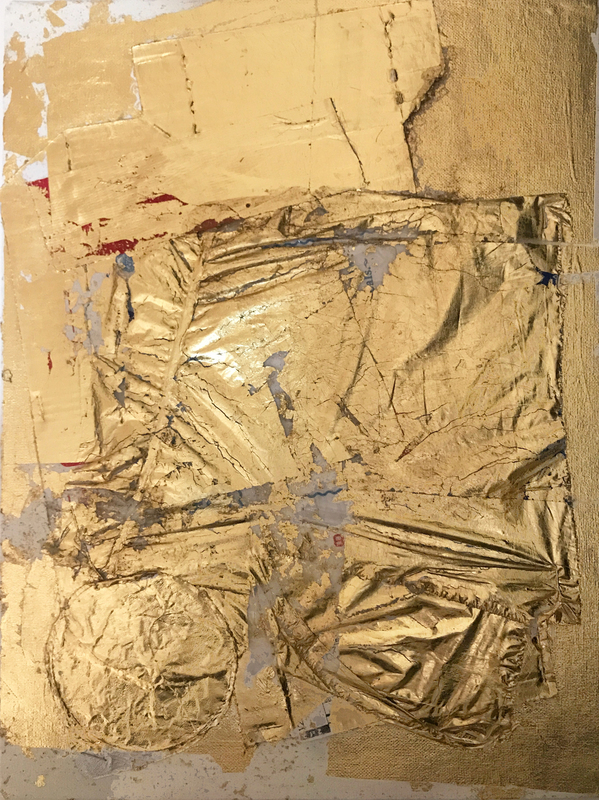 Gold leaf gilding was successful at changing the materiality of the objects, but it looked slightly messy and crude because it did not attach to the surface neatly.